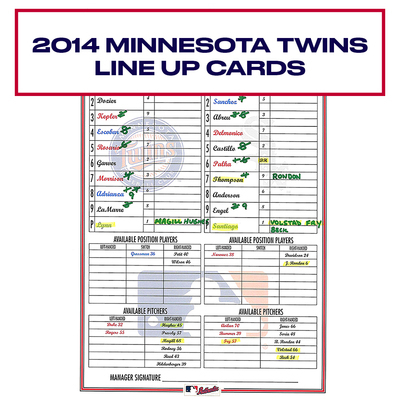 Home 2014 Minnesota Twins Game-Used Lineup Card - Choose your Game Date! Official game-used lineup card from the 2014 Minnesota Twins season authenticated by trained MLB authenticators and affixed with a tamper-proof hologram. Each lineup card includes a clear 11x17 display sleeve. The image shown is descriptive only and may not represent the condition of the actual item being sold.